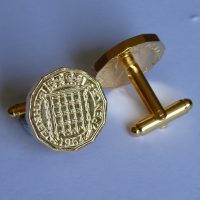 These coin cufflinks have been made by cutting out the Britannia design on original Farthing coins. 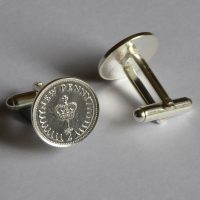 They are available in 1928 and 1929 for a personalised birthday gift. Available in 1928 and 1929. 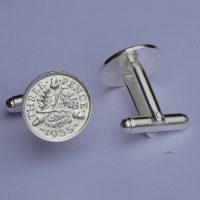 These Silver Threepence coin cufflinks feature a beautiful Oak Acorn design. Available by year: 1931, 1932, 1933, 1934, 1935 and 1936. 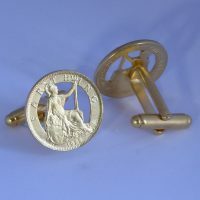 Years available are: 1937, 1938, 1939, 1940, 1941, 1942, 1943, 1944, 1945, 1946, 1947, 1948, 1949, 1950, 1951, 1953, 1954 and 1955. 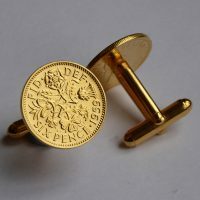 These beautiful distinctive coin cufflinks have been made by cutting out the Wren design on the Farthing coin, Soldering on the cufflink fastening and Gold plating to a very high quality. 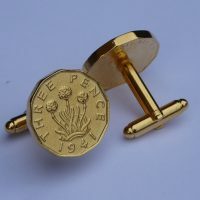 Available in the following years: 1937, 1938, 1939, 1940, 1941, 1942, 1943, 1944, 1945, 1946, 1947, 1948, 1949, 1950, 1951, 1953, 1954 and 1955. 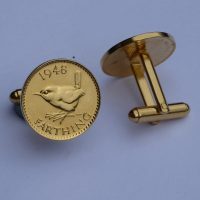 Available in 1947 and 1948. 1949 is a 70th birthday. Available in 1949, 1950 and 1951. 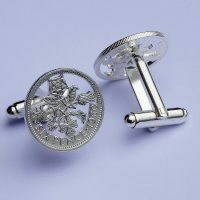 These sixpence coin cufflinks feature the four U.K. National Emblems: a Rose, Leek, Thistle and Shamrock. 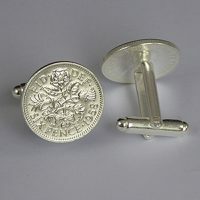 Minted 1953-1967. 1959 is a Sixth birthday. 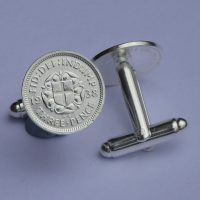 The very distinctive Portcullis Threepence makes a great coin cufflink. 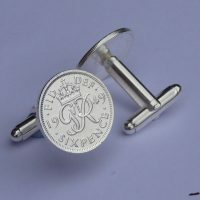 The cufflink fastening is Silver Soldered on to the coin and the Gold plating a very high quality. 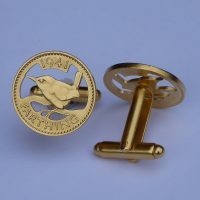 Available in the following birth years: 1953, 1954, 1955, 1956, 1957, 1958, 1959, 1960, 1961, 1962, 1963, 1964, 1965, 1966 and 1967. 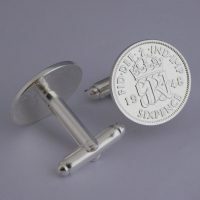 Minted 1953-1967. 1959 60th birthday.